This might be a time when you put this ethical element of your work norms to a physical use. We all know that we need to follow certain work ethics in our professional fields and at workplaces. Many of us stand up for the work we do and have the courage to say it when things are not right. It might be time that we put that same attitude to work for a more physical benefit. Standing up from time to time forces the big muscles in the legs and back to the contract. Enzymes flow increases that attacks fat found in the blood stream. Every time you change position from sitting to standing your body will start to burn calories. These are some of the physiological changes that occur to your body with the simple act of standing up from sitting down. Imagine how much more calories you would be burning if you actively walked about in your office every hour or so? We are prompted to sit down as our work desk and chair make us do so. 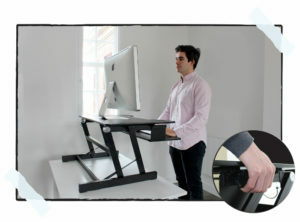 What if your work desk converted into a standing one? You would be forced to stand and work which would certainly get your blood circulation up and keep you more active through the day than when you sit at a desk for hours. How about a desk that could help you stands or sit down as and when you want? That is what the standing desk designs aim to offer desk job workers. Such a desk is designed to be adjustable in height. You can place a desktop or laptop in a position that is at a comfortable height for your neck and eyes. You can convert a standing desk into a sitting desk easily. These are some of the benefits you will get when you invest in a standing desk. If you spend a lot of time sitting and working, it would be best that you invest in such a desk. You will be able to stay more active at work as standing up during working prompts you to change position more often. You would end up walking around more which would be more beneficial.